A root canal in Tijuana is needed when you have deep decay that has reached the nerve. Decay starts at the surface of the tooth in the enamel. If we catch it in time in turns into a superficial filling; if it progresses it can reach the dentine ending up in a bigger, dipper filling. But if left unchecked it can go all the way to the center of the tooth were the nerve is and that’s when you need a root canal. 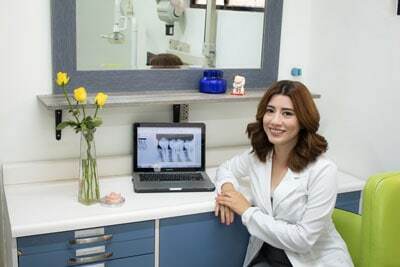 Since it is the dentist’s job to remove decay, he will follow it wherever it has traveled, and if it has reached the nerve, your Tijuana dentist will reach it to. In no way is it the dentist fault if you end up needing one. Root canal is the removal of the tooth’s nerve by the dentist and it happens when cavity has infected the pulp of the nerve. Unfortunately this can be without pain; and I say unfortunately because since it doesn’t hurt you don’t think that there is something wrong with the tooth until it’s too late. And when it hurts it can turn out to be that unmistakable tooth ache that can keep you up all night. Often you will be asked to take antibiotics and pain killers prior to the root canal treatment. 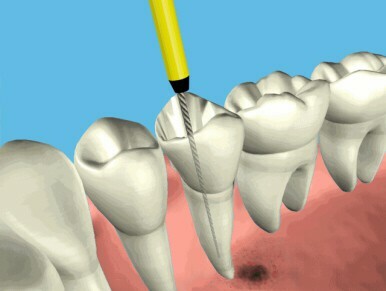 Starting a root canal is the first part in rehabilitating your tooth; afterwards it needs to have a post and then a crown before you are able to chew with it. At Dental 6th & E we understand that root canals are controversial between traditional and holistic dentistry; some people like them, others prefer to be without one. We will work with you to help you make the right decision depending on your past and present overall health situation. And if the decision is to have one, rest assure that all of our root canal procedures are done using a rubber damn, ozone gas and ozonated water to lessen the toxicity in dental materials plus our x rays are always 100% digital.